We can't stop watching it! Dr. Pimple Popper, aka Sandra Lee, M.D., is at it again with her mesmerizing pimple popping videos! But this time, it's with blackheads and sebaceous filaments—and she's using everyone’s favorite tool for plucking their brows, tweezers. Now before you scroll down below and watch it, we're advising you not to try this on your own at home. Since Sandra is a licensed dermatologist, she knows all the precautions to take when popping pimples, blackheads, and cysts using a pair of tweezers. Lo and behold: We know it's gross, but watching it soothes us! 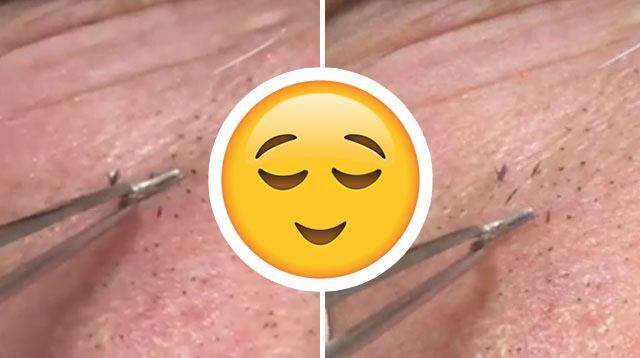 Yup, those aren't large pores on that man's cheek—they're blackheads, A LOT of them.